The large Latin American country of Argentina has a population of more than 44.7 million people. It has one of the most advanced telecommunication infrastructures in the region, although in rural areas communication services still need improvement. 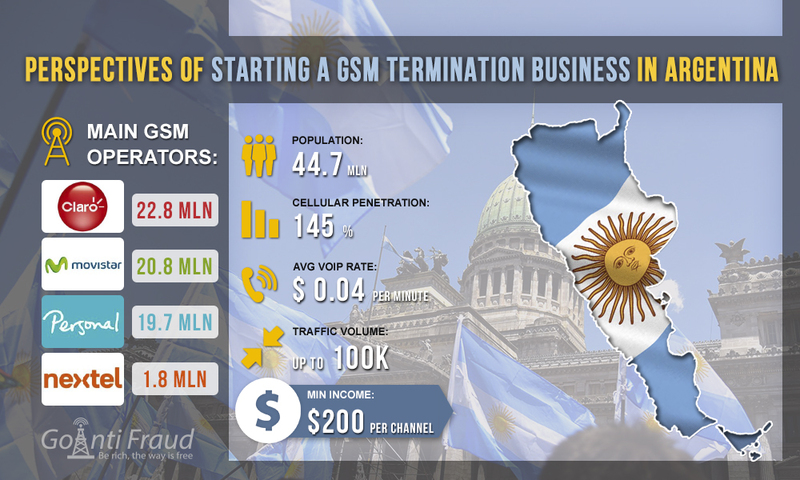 All the same, the mobile communications market is well developed in Argentina, with a mobile penetration reaching 145% (about 64 million connections). This opens up great opportunities for starting a VoIP traffic termination business. As we can see, three of the operators have approximately the same share in the market, while Nextel is quite small. This is due to the fact that the service provider appeared on the market only in 2017. MVNO (Nuestro and Quam) also operate in Argentina. Their cards can also be used for termination. Prepaid SIM cards from all operators in Argentina are called ‘chips’ and are sold all over the city. The cost of one start plans is about $0.5. So far, you do not need to register your sim-cards in the country, which is beneficial for the terminators. Competition in the market dictates minimum range of prices for cellular communications, which means that with the average internet voip call rates around $ 0.04 per minute, one can earn at least $ 200 per channel on termination.